Abby the Librarian: Twelve Days of Giving: Big Kids Read Picture Books, Too! A common misconception is that picture books are only for little kids, for preschoolers. That by the time you're in grade school and can read chapter books, you don't need picture books anymore. 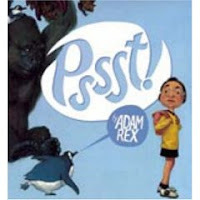 Today I'd like to suggest some of my favorite picture books for older kids. These have fantastic art and/or funny illustration. They've got funny poems or longer stories. As much fun to look at as they are to read, they're perfect for sharing with a child in your life or for a kid to enjoy on his or her own. Pssst! by Adam Rex. It was just an innocent trip to the zoo... until she hears "Pssst!" As she walks through the zoo, animal after animal asks her for something. At the end of the story, you see the fantastic creation the animals make with all the junk she brings them. Funny, detailed illustrations make this one great for examining up close and it's one of my favorites to bring to storytimes for grade school kids. Speaking of Adam Rex, do not miss his poetry collections: Frankenstein Makes a Sandwich and Frankenstein Takes the Cake. They are laugh-out-loud funny and perfect for grade sc hool kids. A long-time favorite of mine is Chris Van Allsburg's Two Bad Ants. This story gives the reader an ant's-eye view of the world as a colony of ants discovers a path to the sugar bowl. When two bad ants stay behind to eat as much sugar as they want, they find that life outside the anthill is not all it's cracked up to be. Chris Van Allsburg is the author of The Polar Express, Jumanji, and Zathura which were all turned into movies. They're all great books, but don't overlook this gem! 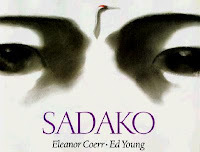 If you know a kid who doesn't mind a good cry, pick up Sadako by Eleanor Coerr and illustrated by Ed Young. It's a picture book adaptation of Sadako and the Thousand Paper Cranes, the story of a Japanese girl who gets lukemia due to the radiation from the Bomb. This is a definite tear-jerker (I'm tearing up just thinking about it), but the art is absolutely gorgeous and it's a very powerful story. 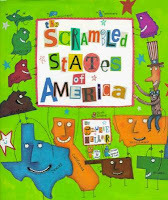 On a much lighter note, I'm a huge fan of all of Laurie Keller's books and a particular favorite is The Scrambled States of America. When the states realize they're in a rut, they decide to switch things up a bit and they all move to a different location. They meet new states, see a different view, and even fall in love... but in the end they realize they're happiest back where they belong. Also check out the sequel: The Scrambled States of America Talent Show. The Elev enth Hour by Graeme Base is a beautiful picture book that has a mystery for the family to solve together. Horace the Elephant is throwing a lavish birthday party, but someone has made off with the feast! Clues are buried in the gorgeous illustrations and you'll find the answer sealed in the back of the book. Give this one with a promise to work on solving the mystery together. The last ones I'll mention are some new favorites of mine. April Pulley Sayre has created some books perfect for animal lovers. With really silly illustrations and a great rhythmic text, the books are equally fun to read and look at. Hand Bird, Bird Bird: A Chirping Chant to your young ornithologist. 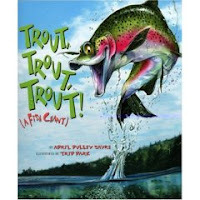 Give Trout, Trout, Trout: A Fish Chant to your young fisherman. And present Ant, Ant, Ant: An Insect Chant to the kid who's fascinated by creepy crawlies. I'm so glad you included "The Eleventh Hour" on here! I'm glad you like the chant books. Schools have been doing some amazing art and activities related to those books. In Nov, I went to a school that did a hilarious turkey chant! I'll post that today. Off the picture book spectrum, I, too, liked the Hunger Games. Congrats on NanoWriMo. Many of my friends are doing that, too.